The Heartbeat of Haverhill had put it off for a year. We had a new museum in the city (one we ‘stole’ from North Andover, Hillies gotta love that) but with its limited hours, semi remote location, and focus on printing. the visit had been put off again and again though it opened in September of 2016. We needed to change that! THOH was accompanied by a Millennial, you know that desired demographic marketers can’t stop trying to understand, who’d been teaching history in South Korea for the last 6 years, making us think she might have specific understanding of printing’s role in history. As we approached the entrance to The Museum of Printing, a poster on the door of the mostly bland building announced a special activity that sounded more like an ear shattering concert than a printing exhibition at MOP. “welcome to Hot Metal Day”, indeed. What had we gotten ourselves into? Our concerns were instantly allayed as about the most gracious host ever invited us to screen a printing documentary though it was already nearing the halfway point. We were going to pass, but he looked so crestfallen because we were going to miss something awesome that we followed him into the screening library where he slid cookies and snacks in our direction as we viewed an absolutely enchanting and engrossing film. The passion of the participants in the film spread to the viewers and we smiled, laughed and perhaps got misty eyed with the folks recounting their Linotype days. We were an odd viewing crowd half millennials and hipsters, 1/2 boomers and artists. BIG ADVICE – watch the movie. We had a lot of favorites throughout our visit – THOH has a long history in advertising so we loved remembering our earliest days hanging out in the art department as they did paste up after receiving a package of copy from a type house. We looked for our first electric typewriter – the Selectric and saw the font balls elements – in Courier and Pica. The Millennial chuckled at the size of the first iPod and test drove a manual typewriter… until she got stuck. “What do you do when you get to the end of the paper?” she queried. THOH had to explain how to use a manual return. My home is filled with several antique typewriters, the black cast iron heavy duty kind, and so I felt more at ease among these mechanical friends than she did. We both loved the prints on display in the art gallery; we were especially drawn to the vivid colors of Mark T Fowler’s prints and as luck would have it, they were available in the gift shop. But this is a rotating exhibit so check the website to see which artist is showcased when you are visiting. But the big thrill of the day was working with the actual printing presses with Ted and the 500+ degree molten lead/aluminum that would make our slug. We got to layout the type for a hot metal slug with our name on it, and use it to print a certificate of participation, then keep the slug. See that part that says Heartbeat of Haverhill – I did that line (and got ink on my finger to prove it) under the careful guidance of Ted. There is a display where you can see not only the exact newspaper the New York Times printed when the astronauts walked on the moon but the process that printed the page. When we arrived home and recounted our visit, both the millennial and I spouted myriad facts: the origins of the terms ‘upper case’ and ‘lower case’, that the old machines are all still working, but not the more contemporary units, that the pillar in the library is beautifully mosaic-ed with half tone images that would be an awesome addition to our home. That I can’t wait to bring my dear friend and art director from my first ad agency to share this precious space. That this entire museum is run by 15+ dedicated and well versed volunteers, that there are lots of one-of-a kind items in the museum that could have been lost if not for the tenacious team….. 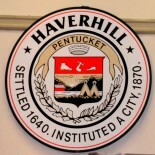 Thanks to Kim Picard (there are more men in the world named ‘Kim’ than women), Laurie Hartman, Ted Leigh, Frank Romano, and Billy Souci for making our visit one worth sharing with the world, starting with Haverhill. The Museum of Printing is located at 15 Thornton Ave., Haverhill, Massachusetts and is open every Saturday, year-round, 10am to 4pm. Special groups and classes available upon request. Admission is $8 for adults and $5 for children, students and seniors. No charge for members. Special tours and museum rental are available by contacting Kim Pickard, info@museumofprinting.org. support them with membership, visits, donations, and by using the museum as a meeting or event facility. these were i our art department, yellowed but there. Thank you Allison, This was so interesting. I look forward to visiting MOP myself. I enjoy your blogs very much. Thank you for reading The HearTbeat of Haverhill! So glad I can encourage people to check out the wonderful things we have in our City. This entry was posted on August 12, 2017 by Brain4Rent/THoH in Alison Colby-Campbell, Antique printing presses, Cool things to do in Haverhill, Haverhill Attractions, Haverhill Cultural Council, Haverhill MA, Haverhill Massachusetts, History of printing, Museum of Printing in Haverhill, New England Historical Area in Haverhill MA, photography, The Heartbeat of Haverhill, Uncategorized and tagged AlisonsBrain4Rent, Billy Souci, Brain4Rent, Family fun, Kim Pickard, Laurie Hartman, Museum of Printing in Haverhill, photography, printing, rank Romano, Ted Leigh, typesetting.